Despite the new lawn mower arrivals which are either self-propelled or electric, many homeowners with a lawn still prefer the more classical gas-powered push lawn mowers. If you’re one of those people, then the Husqvarna Lawn Mower 5521P might be the right lawn care tool for you. Powered by a 140cc Briggs & Stratton engine and with a reduced fuel consumption, this lawn mower was designed to mow small to medium size lawns in a breeze. In this Husqvarna Lawn Mower 5521P review, I’m going to show you why the Husqvarna 5521P can beat not only the mowers in its class but also its environmentally-friendly counterparts. What to Consider Before Buying a Gas-Powered Lawn Mower? Before deciding to buy a gas-powered push lawn mower, you should be aware of a few things. First of all, these mowers are not self-propelled. This means that you will have to use your physical force to push the mower while the engine will only power the blades, making the grass cutting easier. For this reason, these mowers are suitable for small and medium size lawns. Secondly, the gas-powered mowers are noisy, polluting, and because they are equipped with an engine, rather heavy. You should also consider the hidden costs of these mowers. Remember that they need the right type of fuel and oil to function, therefore you will have to buy them regularly. Another downside of the gas-powered mowers is the storage of the fuel that represents a hazard especially if you have children. 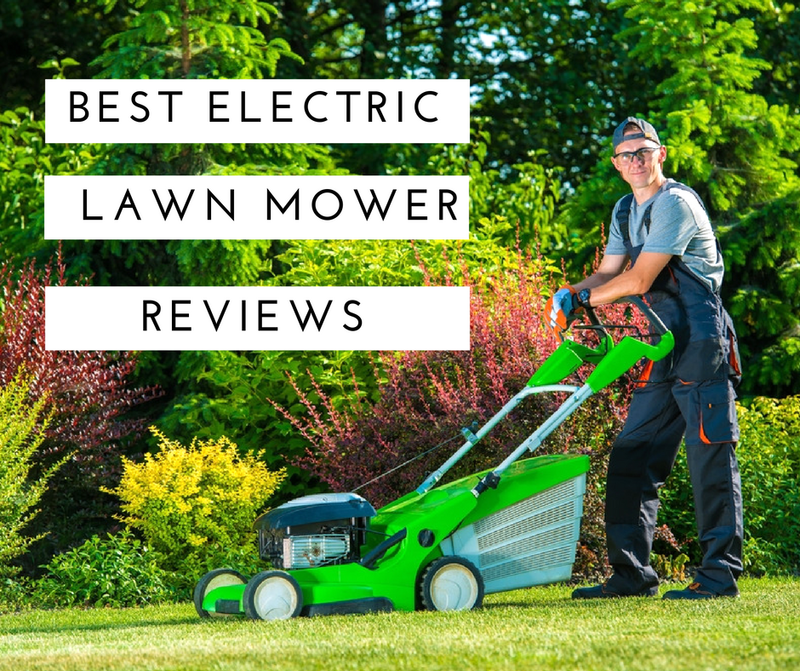 However, there are many good reasons why you should buy a gas-powered push mower. Compared to the electric mowers, the gas-powered mowers give you more freedom to move and are more powerful. The cutting quality is also most of the times better than the cutting quality of the electric mowers. Cutting functions: a mower with mulch, bag, and side discharge functions is more versatile. Conveniently located fuel and oil tank. Wash-out fitting: a hose connector designed to allow you to clean the cutting deck easily. Tall rear wheels: they give a better traction and help you maneuver the mower more easily on rough terrains. Husqvarna is a manufacturer who knows how to address its customers’ needs and the proof is the Husqvarna Lawn Mower 5521P, a mower designed to provide excellent results while boasting an enduring quality. The 5521P is easy to operate, relatively lightweight and easy to maneuver on almost any type of terrain. The 140cc Briggs & Stratton engine provides enough power to make this mower suitable for any type of grass, while the 3-in-1 cutting system gives more versatility to the mower. Powerful: the 140cc engine provides sufficient energy to get an even cut on any type of grass. Dual seal engine: this feature minimizes the debris intake, extending the engine’s lifespan. Easy to maneuver: the 5521P features four large double ball-bearing wheels designed to improve the maneuverability of the machine. The rear wheels are slightly larger than the front wheels, a characteristic that improves the traction and the maneuverability of the mower on rough or sloped terrains. Foldable handle: for easier transport and storage, this lawn mower features a completely foldable handle. Adjustable cutting height: perfect for any type of grass, the 5521P boasts five different cutting heights. This mower comes with an uncovered engine, being noisier than the other mowers in its class. It is quite hard to adjust the cutting height. Despite having a completely foldable handle, the overall dimensions of the mower are still large and it occupies a lot of space. The Husqvarna 5521P features a 21-inch steel cutting deck designed to help you mow the lawn fast and efficiently. The cutting deck can also be adjusted to five different heights, so you will be able to choose the right height for any type of grass. The cutting deck is also equipped with the popular 3-in-1 cutting system. You will be able to choose the most appropriate between mulch, side discharge or rear bagging. The only downside of the cutting deck is that it seems to be of a rather poor quality. The deck is made of a thin sheet of steel, which is probably capable of decreasing the stability and rigidity of the mower. The 5521P is equipped with a powerful Briggs & Stratton 5 1/2 torque 140cc engine that provides sufficient power for the blade to cut efficiently through all types of grass. The powerful engine also provides enough energy to ensure excellent cutting results on uneven terrains. The 5521P works with standard gasoline. Remember that you should use gasoline alone to power this mower, unlike many other models that require a mix of oil and gas. Husqvarna equipped its 5521P lawn mower with large front and rear wheels that increase the stability and maneuverability of this tool. The 8-inch front wheels and 12-inch rear wheels will allow you to push this mower over a rough terrain effortlessly and you will also be able to maneuver the mower easily around trees or flowerbeds. For more versatility, you will be able to adjust the cutting height to five different positions, ranging between 1.25 and 3.4 inches. The only downside is that you will have to adjust the cutting height separately for each wheel, which is rather time-consuming and annoying. However, this shouldn’t be an issue if you like to cut the grass at the same height each time you mow the lawn. Besides the guarantee of the Husqvarna quality, the manufacturer offers a two-year limited warranty for parts and labor. Most of the users are fully satisfied with the performances of this mower, claiming that the 5521P is easy to assemble, easy to maneuver and able to provide excellent results. The mower is also defined as sturdy and well-built. Some users complained about the performances of this mower, but its overall rating is still excellent. 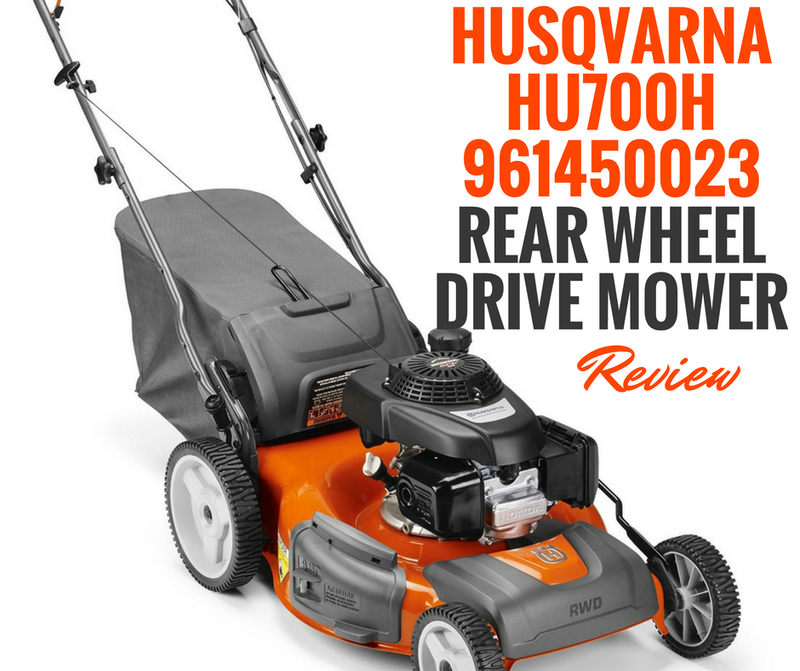 You can click ﻿﻿here ﻿﻿to read more Husqvarna Lawn Mower 5521P customer reviews. Equipped with a Powermore 140cc OHV engine, this push mower from Yard Machines is a great alternative to the Husqvarna 5521P, if you are searching for a more affordable tool. 20-inch cutting deck: compared to the 5521P, the Yard Machines lawn mower has a slightly narrower cutting deck of only 20 inches. This could be a plus if you have a narrow garden. Small wheels: with 7-inch front and rear wheels, this mower is not as easily maneuverable as the 5521P. Weighing only 48 pounds, this mower is more lightweight than the Husqvarna, which weighs 60 pounds. Find out more about the features and performances of this push lawn mower here. With a Briggs & Stratton 5-torque 140cc engine and weighing 65 pounds, this push lawn mower from Craftsman has similar performances to the 5521P. It also features the popular 3-in-1 cutting system. 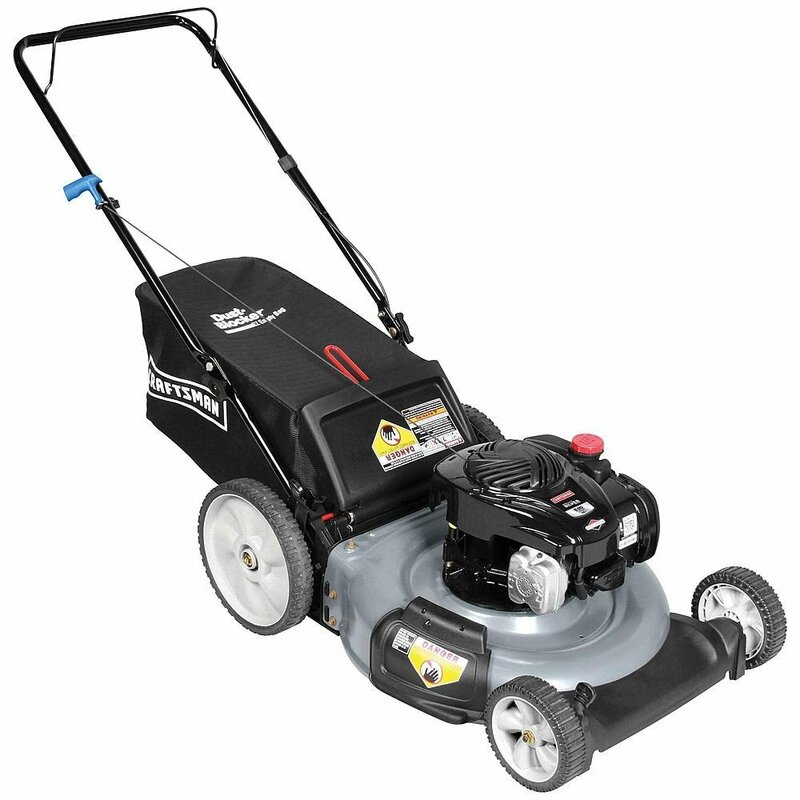 21-inch cutting deck: similar to the 5521P, this lawn mower also boasts a 21-inch cutting deck with mulch, discharge and bagging functions. Smaller wheels: compared to the 5521P, this mower has smaller wheels. This mower has 7-inch front wheels and 11-inch rear wheels. The cutting height ranges between 1.25 and 3.75 inches. This Poulan lawn mower has an engine and cutting deck similar to the 5521P, including the five cutting height positions. It is more affordable compared to the 5521P. 2-in-1 cutting system: you will only be able to choose between mulch and side discharge, because this mower doesn’t have a bagging option. Smaller front wheels: the front wheels of this mower are only 7 inches. The Pro 961120131 is more lightweight compared to the 5521P, weighing only 52 pounds. Find ﻿﻿out ﻿﻿more about the features and performances of this push lawn mower here. I believe that the Husqvarna 5521P is a valuable lawn care tool, with a fair price for its quality and usability. Like any other product, the 5521P may have some flaws, but it its performance is excellent especially if you have a small or medium size lawn. The 21-inch cutting deck will allow you to mow the lawn fast and efficiently, while the large wheels will allow you to maneuver the mower with ease regardless the type of terrain you have. The mower can also be controlled easily on sloped terrains, which is a big plus. For versatility, you will be able to choose the desired cutting height and the preferred cutting option. If you want to find out more about the price and features of this mower, click on this link.